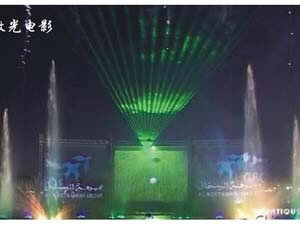 The laser fountain is mainly used in public places, and it has perfect business performance. Its laser performance system is mainly comprised of laser head, laser power supply, controller and water filter. And its controlling system is made up of Pentium multimedia computer, high-speed control drive component and true-color multi-media laser animation program. 1.It is able to display flow quality of water. 2.It combines dot, line, face and cube into a whole. 3.Its stable laser display system can operate continuously for a very long time. 4.Its laser device is simple, reliable and maintenance-free. And the urnkey engineering technique is used for this device. 5.Multiple light-pen scanning technique has been used to display grand and gorgeous effect when showing large complicated scene and space. 6.As single beam of the laser has strong energy, it can strongly focus wards and patterns on the water curtain what other measures couldn't match. 7.Through scanning of light beam and change of light power, it can obtain very high brightness and gorgeous colors and rich expressing ability. Established in 1984, Guangzhou Water Art Fountain Irrigation Garden Co., Ltd is a professional manufacturer of laser fountain in China. In addition to laser fountain, we still provide customers worldwide with music fountain, programmed animated fountain, garden fountain, square fountain, scenic fountain, waterfall rockery, sculpture fountain, floating fountain, waterfall feature, digital water curtain, creek water feature, indoor water fountain, direct jet nozzle, central upright fountain jet, morning glory nozzle, flower fountain jet, rotary nozzle, flat nozzle, adjustable nozzle, water sphere and hemisphere nozzle, etc. We have built water features for Spring Festival Evening Gala of China, China Art Festival, and many other Chinese literature and art activities. And so far, we have set up long-term cooperation relationship with customers around the world, such as Malaysia, Brunei, Tajikistan, Saudi Arabia, UAE (United Arab Emirates), and many other countries in Central Asia and Southeast Asia. If you're interested in our laser fountain, please contact us freely.